There is already a Sri Lankan naval base there, which, according to the agreement, will become a property of the joint venture company. 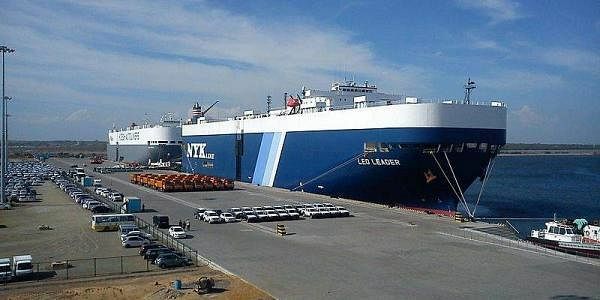 COLOMBO: A draft Sino-Sri Lankan agreement on the controversial Hambantota port says that the Sri Lankan government has the sole right to decide whether or not, at any given point of time, the port can be used for a military purpose. Thus, the draft agreement does not completely rule out the use of the Hambantota port for military purposes. It only says that the decision in regard to any kind of military use will be the prerogative of the Government of Sri Lanka. In fact, there is already a Sri Lankan naval base there, which, according to the agreement, will become a property of the joint venture company. The proposed arrangement is in line with India’s wish, as New Delhi has been asking Sri Lanka to keep its ports, including the Hambantota port, under its control, and has been worried by Colombo’s moves to hand over a section of the Colombo port and the Hambantota port to China, which had constructed the installations with Chinese funds. In November 2014, a Chinese nuclear submarine had allegedly berthed at a container terminal in Colombo constructed by the Chinese, raising the hackles in New Delhi. And by an earlier proposal, CMPPort was to take 80% stake in the Hambantota port for US$ 1.1 billion and get full control of it for 99 years with little or no Sri Lankan control over security. As per the latest drft agreement, an Oversight Committee comprising representatives of the Sri Lanka Navy, Sri Lanka Police, SLPA and the Secretary to the Ministry of Strategic Development and International Trade will control the “national security” of the Hambantota port. Internal security will however be the task of the joint venture company but that too will be monitored by the Oversight Committee. The joint venture company shall be capitalized with an amount of US$ 1.4 billion (transaction value). CMPort will invest a maximum of US$ 1.12 billion (investment value) by itself or through its affiliate, by subscribing or purchasing 80 percent of issued share capital of the company. The balance 20 percent will come from the SLPA. CMPort’s money will be paid in three tranches within six months, subject to fulfillment of conditions. A security payment of US$ 5 million has already been deposited. The deal will give CMPort sway, not only over Phases I and II, but over the proposed Phase III, which is still just a concept. The total land to be leased out is 1,235 acres (5 sq km) together with a man-made, 46.2-hectare (114-acre) island. The joint venture company will get all movable property and port infrastructure within that area “including the naval bases which are established within the Port Property as at the date of execution of this Agreement”. The SLPA will transfer the port on a 99-year lease, free of any liabilities, including loans, tax, litigation, claims, environmental liability or other statutory liabilities. The site lease agreement will be reviewed 15 years after its first execution and thereafter at five-year intervals. The joint venture company will be entitled to set and revise port tariffs and take the benefits and revenues of all port services and activities defined in the agreement. It will operate as an independent, profit-oriented enterprise. Any arbitration under the agreement shall be held in Sri Lanka. The joint venture company reserves the right to conduct any project within the leased area without offering such project to any third (non- Sri Lankan or non-Chinese) party.